THE family of a Northern Ireland supporter who died at the Stade de Lyon as he watched the team beat Ukraine at the Euro 2016 tournament in France has said he was "doing what he loved best" at the time. Robert Rainey, known as Archie, is understood to have suffered a heart attack in one of the stands. Medics and stewards rushed to the scene, but efforts to resuscitate the 62-year-old Belfast man inside the stadium were unsuccessful . He was later pronounced dead. His family said he died "doing what he loved best". In a statement released through the PSNI, the family said: "Our father Robert Rainey, known to everyone as Archie, has sadly passed away whilst in France supporting Northern Ireland at the Euros surrounded by all his friends and family. "We are obviously devastated at this loss, and thankful for everyone's thoughts and prayers, we would appreciate privacy at this sensitive time." 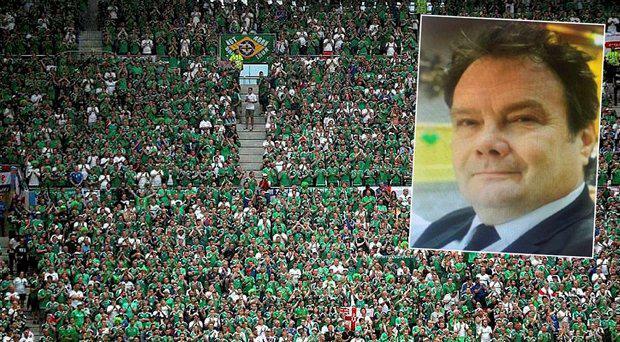 Mr Rainey is the second Northern Ireland fan to die in France this week. Northern Ireland's captain Steven Davis said: "It is terrible news and we'd like to send our condolences and deepest sympathies to his family." "The fan passed away as he was watching the game in the stadium. This puts any result of a football match into perspective," IFA Chief Executive Patrick Nelson said in a statement. The FAI also expressed their condolences. 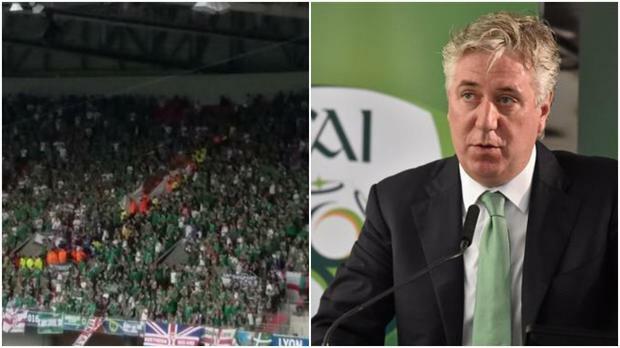 “This is a sad outcome to what was a historic day for Northern Irish football following their victory over Ukraine," FAI CEO John Delaney said. “On behalf of everyone in the FAI and the Republic of Ireland squad, I would like to express our sadness and condolences to IFA President Jim Shaw, CEO Patrick Nelson and all who are associated with the Northern Ireland squad. “We also remember the friends and family of another Northern Ireland fan Darren Rodgers who died earlier this week in a tragic accident in Nice, and we would also like to remember Republic of Ireland supporter James Nolan, who died four years ago in Poland, during EURO 2012." 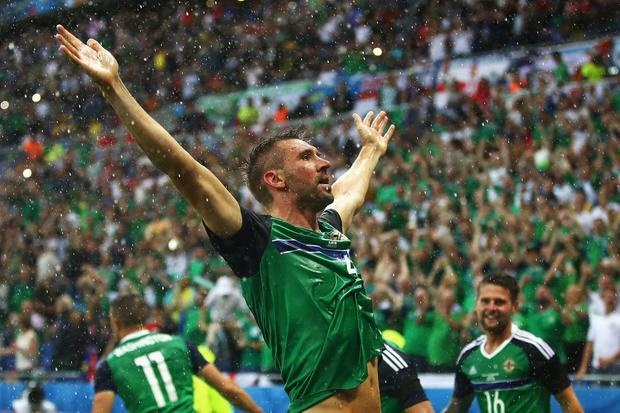 The tragedy mars what was an otherwise famous night for Northern Ireland, after Gareth McAuley and Niall McGinn scored during the second period to give Michael O'Neill's side three crucial points. Superintendent Nigel Goddard said: "Our thoughts are tragically with a second family this week mourning the devastating loss of their loved one. "We understand the man aged in his sixties collapsed during the game and was attended to by emergency services in the Stade de Lyon. "It is extremely sad that this is the second death of a Northern Ireland fan in France during the Euro 2016 games." On Monday Darren Rodgers, 24, from Ballymena, fell eight metres off a promenade in the south coast city of Nice and died. Fans applauded his memory in tribute during the 24th minute of Thursday night's match. Mr Goddard said the Service had been liaising with French authorities and local PSNI officers have been in touch with the man's family in Belfast. Flags, shirts and scarves have been left at the ground in tribute to the dead man. A paramedic who treated him said: "We tried but we could not. It is very sad." The Olympique Lyonnais ground was packed with Northern Ireland supporters who have travelled to France in their droves for Northern Ireland's first major tournament in 30 years.